Last week we looked at Ladies shoes, this week let’s look at the Tradies. Canberra is full of tradies and your footwear whilst on the job is really important. 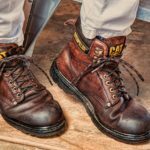 A common problem among tradies is having foot problems caused by their safety footwear such as sore feet. These foot problems extend beyond just the building industry, as people across all trade industries, from construction to mechanics, complain their safety footwear is uncomfortable and does more harm than good for their feet. Given that safety boots are heavier – they can wear down your feet and legs more than regular shoes. The good news is that your body gets used to them over time and exercising to strengthen your leg muscles helps ease the soreness and pain, possibly eliminating it entirely. Seeing your podiatrist to make sure the boots you own are a great fit to your feet, is also a great benefit. Safety boots/shoes typically have a steel cap or plastic cap and by their nature, work boots aren’t flexible. Wearing incorrectly sized shoes causes the steel plates and the toe to cut into feet, causing chafing. This is can leave you unable to stand properly. The chafing presents itself as a burning sensation in the feet. For loose fitting boots, this problem can be temporarily solved by putting a soft insert into the heel or insole area of the shoes. The ideal solution, however, is to have boots that fit properly in the first place. Tight boots can lead to problems like corns, calluses, hammertoes, and blisters. These are debilitating conditions for people working on their feet all day. Again, correctly fitting boots can stop this in its tracks. There should be enough room to wiggle your toes from the moment that you buy your work boots. Wearing tight work boots every day for long hours can cause bunion development. Tight work boots, especially in the toe area, can put excess pressure on your toe joints which can eventually lead to protrusions in the big toe joint area. Bunions are a painful condition which can hamper your everyday work and may require surgery to eliminate the problem. It’s always better to stop these problems in their tracks than deal with them later. Contact your podiatrist to ensure you have the right footwear and you’ll thank that decision as your long days in the job take place. If you are suffering from any of the above issues make sure you call Canberra Podiatry today on 6281 1200 for an appointment, we’ll make sure you put your best foot forward as you head to work.